ONLY READ if You Want Great Spring/Summer Hair! Spring is definitely here, and summer is right around the corner. While we love the hot temperatures and bright sun, it isn’t doing your hair any favors. We have all the tips, tricks, trends, and treats to keep your hair healthy and bright during warm weathered days and nights. The first think that I think of when someone mentions summer (besides the perfect margarita) is the hot sweaty sun. in most cases, you shouldn’t be washing your hair everyday, but after standing in the sun you might feel like you will want to. Try to wash every other day, or every 2 days if you can. On your non-wash days, use a dry shampoo. We love Pret-A-Powder from Bumble and Bumble. Try to think about dry shampoo and a preventative action, and use it before you expect to work up a sweat. The best times to use dry shampoo are before bed, before the gym, and before you head out to the park for the day. Pret-A-Powder will help absorb sebum, sweat and other oils your scalp will produce and keep your roots feeling fresh. So now its day two since you’ve washed your hair. You've applied your dry shampoo but you don't know what to do with your hair. Answer: BRAIDS. We love a loose romantic single braid, or a tight sleek double dutch. Braids are coming back in a major way all over the runways and at every music festival. 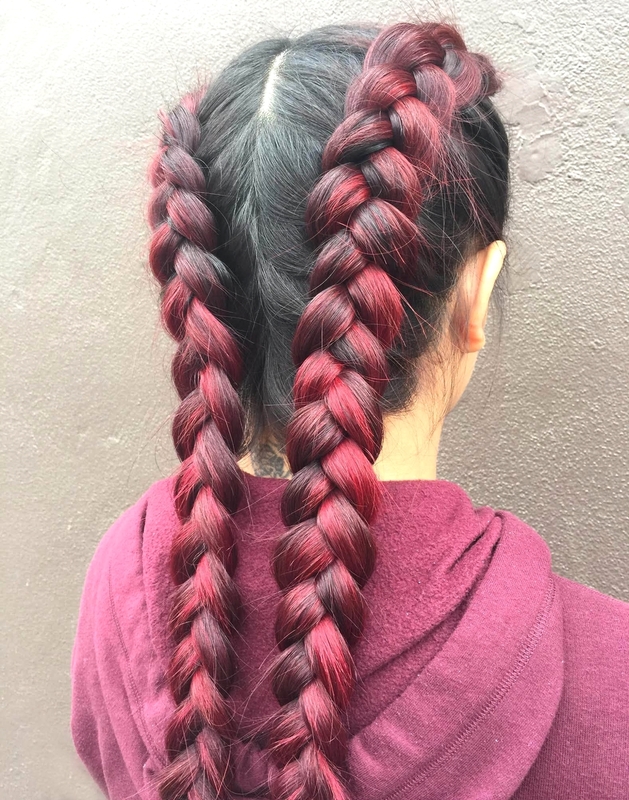 If you are a newbie at braids, book a 30 min style appointment with Amy and she can teach you some basic braids or something way more than basic. Braid styles work great for evenings out or days in the office. Braids aren’t just for day 2 hair either. Give your head a great scrub and rich conditioner, then ring out all the excess water and apply a great leave in product like Momo Hair Potion. Braid your hair while its still slightly damp and wear it for the day and night out. In the morning, let down your perfectly waved beachy locks for an effortless style on the go! The last piece of advice we have is for anyone who has any kind of blonde. Whether its a full head of platinum hair or some soft face framing highlights, the sun is sure to take out any kind of magic your blonde hair has. To avoid lackluster locks, make sure you are coming in between color appointments for a gloss and a treatment. The appointment can be booked for an hour and it might just be the best hour you have all week long. The gloss will add shine and brightness and our fabulous Goldwell instant treatments will leave your hair feeling lush.